The Joel McCann Memorial Trail is part of what will one day be a 16-mile rail-trail from Barrackville to Mannington following the former Baltimore & Ohio (B&O) Railroad. 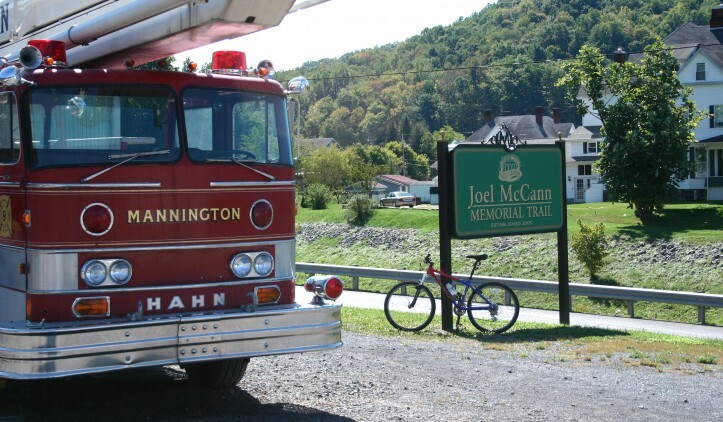 Currently, a 1-mile section of the rail-trail is complete along Buffalo Creek through downtown Mannington and named after one of the city’s longtime fire chiefs. The town itself is named after Charles Manning, a civil engineer with B&O Railroad, and an old railroad depot, built in 1906, sits along the trail. Plans are under consideration to refurbish the building. Trail End Points North Marion Senior Center Walking Trail to Mary Ellen St.
A trail head is located at the Mannington Railroad Depot (at the corner of Railroad Street and 103 West Main Street).